Known for producing utility vehicles, Mahindra tapped into the sedan segment with Verito, earlier named Logan. The sedan has witnessed several changes over the years in a bid to improve in terms of looks to sustain cut-throat competition in the segment. Rugged looks, spacious cabin and a reliable diesel engine make Verito a dependable sedan.Priced affordably between Rs 7.27 lakh to Rs 8.21 lakh (ex-showroom, Delhi), the muscular sedan was previously sold under the Logan nameplate. 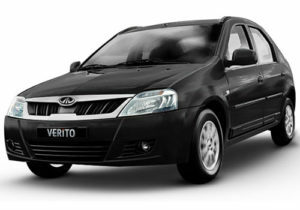 Verito was initially available in petrol and diesel fuel options, but currently it plonks a 1.5 litre, four cylinder engine good for 64bhp and 160Nm. There is ample space for occupants to be seated comfortably inside. Renewed styling, new dashboard and additional features add more comfort to the interior. The Verito has generous dimensions and to differentiate it from the Logan Mahindra has changed the radiator grille which now carries the Mahindra Logo. Also new are the ski racks and side cladding which is a first for a sedan in the Indian market. At the rear the Verito gets a chrome rear appliqué and the rear spoiler. The rest of the car is identical to the Logan and the Verito is available Fiery black, Toreador red, Mist silver, Diamond white, Rocky beige, and Java brown.